Posted on May 7, 2013	by Picture This Great Teaching	in Inspiration	with Comments Off on Joelle T.
I believe that students learn from hands-on opportunities for discovery. Blocks are one way we incorporate this. I love to watch the way the students’ minds work and how amazing their creations can be. 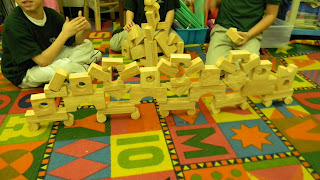 This was a Kindergarten class and they came up with this plan to use all the blocks in one structure and executed it all by themselves. It is inspiring to me because I think it’s a perfect example of what children can do if you give them the opportunity!